Ceranic Plaques featuring Saint-Petersburg views were inspired by a unique collection of watercolors housed in the Hermitage. Elusive graphic masterpieces are reproduced in decalcomania technique on framed ceramic plaques. 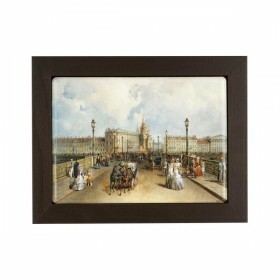 Framed Plaque "View of Palace Square and the General Staff Building, St Petersburg"
Framed Plaque "View of the Spit of Vasilyevsky Island"
Framed Plaque "View of the Winter Palace from the Neva River "
Framed plaque "Winter Palace at night view"